We’re really starting to get into this slow cooker thing. How great is it to come home to food that’s ready to eat? Though, oops — this recipe does have the extra step of making a sauce using the reduced cooking liquid, so it’s not as one-and-done as others. 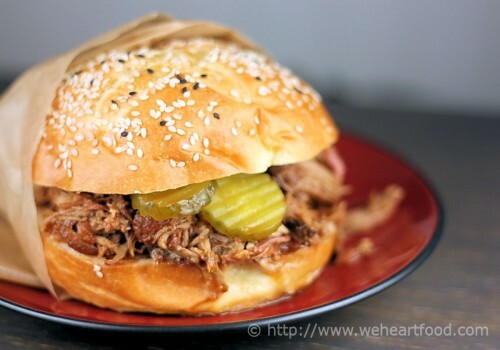 The following is adapted from Slow Cooker Revolution , has the perfect blend of vinegar, smoke, sweet, and moist pork. We served the pork on a Macrina brioche bun. Dee. Lish. Wow, this is great! I can’t believe I’ve never made this at home. This is way better than some of the pulled pork sandwiches I’ve had at restaurants. You know what I think of it; I was sneaking bites before you even finished the sauce. Patience is for suckas. I was hungry. You have to admit, though, it was worth waiting for the finished product… the cider vinegar, the sweet from the brown sugar, and you really get that nice smokey flavor from the ham hock, and, well, the liquid smoke. Obviously it was worth it! I’m just saying. That pork would have disappeared whether or not it was finished. Combine 1.5 tablespoons brown sugar, paprika, chili powder, cumin, 1 teaspoons salt, and 1/2 tablespoon pepper in bowl. Using a fork, prick the pork all over. Rub the brown sugar mixture over the pork, wrap tightly in plastic wrap, and refrigerate for 8 to 24 hours. Place ham hock in slow cooker. Unwrap the pork and place on top of the ham hock. Pour broth over pork, cover, and cook until pork is tender, 9 to 11 hours on low or 5 to 7 hours on high. Transfer pork and ham hock to a large bowl, let cool slightly, then shred into bite-size pieces discarding skin, bones, and excess fat; cover to keep warm. Let braising liquid settle for 5 minutes, then remove fat from surface using large spoon. Strain liquid into medium saucepan and simmer until thickened and measures 1/2 cup, 20 to 30 minutes. Whisk in vinegar, ketchup, liquid smoke, and remaining 1.5 tablespoons sugar and bring to simmer. Season with salt and pepper to taste. Toss shredded pork with 3/4 cups sauce; add more sauce as needed to keep meat moist. Serve on buns with pickle chips and extra sauce.